The Home Diamonds Fiberglass Screen door is a must have in your household! The fiberglass screen door installs in just a few minutes in any doorway of your home and keeps bugs out, let's fresh air in, and allows your dog or cat to freely go in and out of the house. All hardware included (for metal or wood door frames), as well as instructions. No more dealing with claw marks from your pet on your expensive screen door. Fiberglass is much stronger and more scratch resistant than nylon and polyester meshes. Our screen door opens up easily with just a push of your hands or head. The middle seam of the screen door is lined with 28 powerful magnets that allow it to open and close like magic. For further support, we have even added weights on the bottom to keep the mesh straight, also to open and close easily. Fits all door sizes up to 34" x 81". Is not intended to reach the ground upon installation. We value your business and offer a lifetime replacement guarantee. If you're unsatisfied with your magnetic screen door for any reason we will send you a new one at no extra charge. INSTANTLY INSTALLS - Hardware all included. Velcro, metal black thumbtacks and a full frame Velcro screen mesh makes for quick and easy installation and removal. FITS DOORS UP TO 34"x81" - If your door frame measures 34" or less in width and 81" or less in height, then this fiberglass mesh screen door is the perfect fit!! Can be used to replace: fixed screen door and fits front, rear, interior or exterior, entry, patio, balcony, glass, French, and even sliding doors. IMPORTANT: Measure your door before ordering to be sure our screen will fit. AUTOMATICALLY CLOSES! - The middle seam of the screen door is lined with 28 powerful magnetic strips that allow the door to open easily and close seamlessly! Weights are also fitted into the bottom of the mesh to keep the mesh straight and added support for automatically closing. 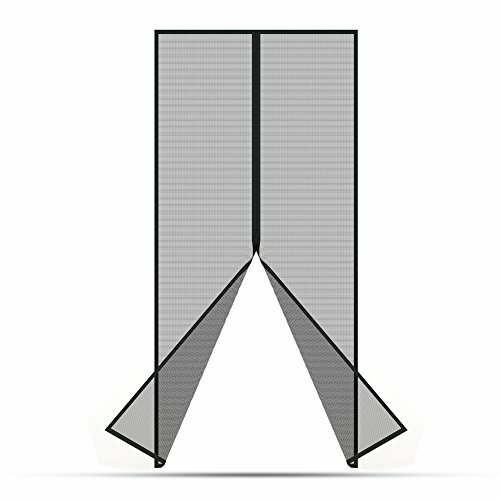 The magnetic screen can be easily removed for months where the screen door is not needed. MULTI FUNCTION - Keeps insects and mosquitos out, lets fresh air in. PET FRIENDLY - Crafted to be functional with Dogs and Cats. Allows cats and dogs to roam the indoors and outdoors with ease. DURABLE, FIBERGLASS MESH - Upgraded fiberglass mesh is much stronger than the conventional polyester mesh. Unlike conventional polyester meshes, our fiberglass mesh does not shrink when it comes in contact with heat. It is also scratch resistant unlike other polyester meshes which come apart when pets scratch them. If you have any questions about this product by Home Diamonds, contact us by completing and submitting the form below. If you are looking for a specif part number, please include it with your message.